Don’t confuse hairstyles with hair designs. Hair designs are excellent ways for individuals to make a statement on their personal style. Quality stylists are proficient enough to create a range of hair designs for men and boys that will look good for men of all ages. Finding someone with considerable skill is crucial. Most stylists will expect clients to come to the session with clean hair and a bit of patience. Though the design process is not overly time consuming, it will require the client to remain as still as possible for considerable periods of time. This should allow the stylist to engage in his/her work and produce something that is truly memorable. As with traditional saloons, clients can select an image from a standard design board. However, many men choose to bring in their own designs to replicate on hair that they may have personally created. This is one way to ensure that the image that is chosen will remain unique while it is being worn. Clients may also ask the stylist to sketch a few possibilities, after which they can pick the one they like best. Some people have a general idea of what they want but have not yet been able to nail down the specifics. The best stylists will look upon their work as a form of art, and as such will take it extremely seriously. Because it is their profession, they will often spend hours learning how to carve even minor details into the hair. Here are some great samples for you to get the hair done with stunning designs. This is a hair design for boys, though there is no hard and fast rule in this case. A grown-up people can also have these curves overlapping each other the head. One can keep the top hair normal with some sideways patterns. Mohawk hairstyle is a great way to rock the hair trend. You can follow the extreme mohawk style with pinkish charm. And the striped hair from the two sides will complement the spikes. This style is for those secret superstars who have a deep-rooted desire to become a star in future. One can depict his desire through the hair designs for men and boys. Kids are very fond of the Spiderman movie and cartoon series. A spidey tattoo will undoubtedly make them happy and ecstatic. 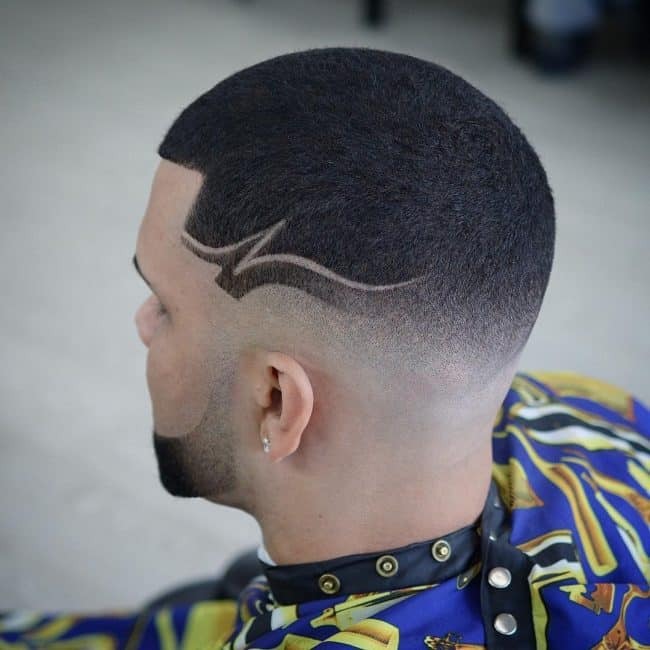 This is a theme based hair design for men. You can express your likings for singing through this type of hair tattoos. Start drawing a line from the corner of the forehead ending towards the marginal side of the back. This is named perfectly as the never-ending line. 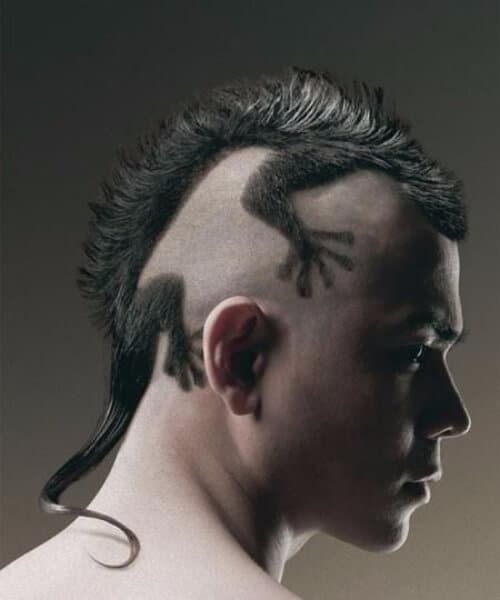 If anyone wants to get exposed and expressed, this could be the best hair design for him. Trim the hair from the sides to a shorter length. Design that as you like, take inspirations from this design. This is a decent looking hair design for the men. Guys who have to attend formal meetings can get this hairstyle. The hair is curly at the top but the back is faded to intensive beauty. Some boys are obsessed with games and sports too much that they can’t think of other things. Well! If you are one of that kind, keep an eye on this hair design for boys. Man bun hairstyle can be associated with different hair designs as shown in this picture. The top knot will enhance the beauty to a great extent. Braids can play a good role to change a hairstyle 360 degree. But this design is a bit sophisticated and needs an expert hair artist to do it nicely. Pompadour is a traditional hairstyle which can be greatly modified by some well-placed lines. Apply the lines on the sides and the top hair is slicked back to look like a pompadour. This is an interesting hairstyle. Trim the hair to a very shorter length and draw some stair-like patterns on the back of the head just above the neckline. If anyone is fond of the mohae[wk spikes, he can try this one. Shave off everything except the hair that is kept to get a mohawk haircut. Fade and lines are two basic elements of a hair design. One can use both of them side by side while doing hair designs for boys and men. Some guys tend to get an extreme hairstyle which will talk for itself. The edges will be very sharper and the lines will be distinctive in this style. This is one of the simplest hair designs out there. There will be one straight line on each side of the head. Creativity is the prerequisite of being fashionable. People will always pamper the creativity in you. So don’t waste the chance to get a creative hair design like this one. Flowers are such great things which can beautify every single being in this world. Check out this hair design. The ear is working like the center of the flower petals drawn on the hairy canvas. Searching for hair designs for boys? You are at the right place. Try this haircut to get the best hair design for your kids. The spiky top is always a great way to rock the hairstyling world. Spike the hairs on the top and shave the remaining part of the head to get this design. Necklines can be designed in many ways to add diversity to a hair design. Get some idea from this picture on how to design the neck hair. This is very simple design to do but it looks gorgeous when done correctly. The sides are shaved and the hair of the top is kept to the desired length as per the patron’s wish. Imagine that the hair is a canvas. Now draw some lines as you want. Just amke sure that the design and pattern look aesthetic. 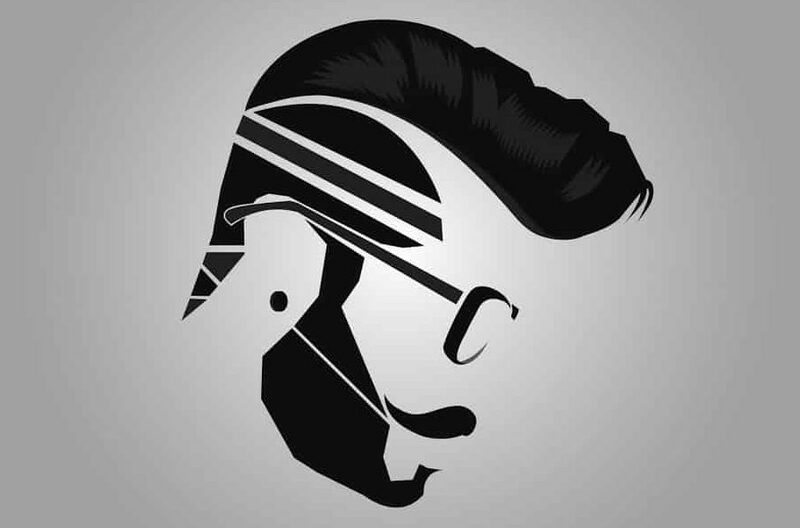 Draw some parallel lines to get this hair design for boys. The hair must be of shorter length while designing the head like this. You might have seen a lot of bun hairstyles for men but this one is surely a top one. Only the top hair is kept long to be tied as a bun and the rest is designed excellently in circular patterns. Hair designs represent the personality of a person. This hairstyle is very stylish yet looking decent. If you can blend decency with a style that produces the best output. This could be considered the best of the best hair designs for me. A ducktail, a fade and designed lines and patterns all these things have been used together in this single hair design. If you want a unique hair design to rock the party, try this leafy design. The hair from the back sides is trimmed and shaved to resemble the image of a leaf. Men should budget for the process. More complex designs will obviously cost a bit more, but this is to be expected. Waiting around for a bit of extra cash is on hand will allow clients to get the tattoo that they have been wanting. Choosing a design that one is truly excited about is an important part of being happy with the outcome. These designs can be especially useful in helping to pick out a design that will look good and stand out. Choosing something that will be respected in the community is one of the highest priorities and should be a carefully considered part of the process. i need me one for 2morro plzz. Loved your work. My son is in to this tattoo which i think is pretty cool. Would love to learn but know pratice is the only way, but what i need is tools. Am pretty good with clippers and a razor.But I know their is a smaller trimmer that can be used. Please fill me in what and where. ( tools thats what I”m talking about. yeahh itz a really very great idea.. and i love all the tattoos which you shared here..
i noticed that football players have a that kind of hair tattoo style..There are many different hair men tattoos design and most of people loved to make the hair tattoo. WHERE CAN I BUY SOME STENCIL OR DO SELL THEM .